I've had this little project kicking around for a bit - it's really more of a technique than a specific project - so I decided to blog it here instead of listing it with the InspirationFXs. This works best, so far that I have found, with Firepolish donuts, the 8 mm size - but there's naught to say that it won't work with some other sizes and shapes too. It would look cool with some other shapes too, I think, like some of the drop beads. It's a super easy project, fairly quick and fun - good cottage project with the kids, as the supplies required are limited. You'll be stringing this on stretchy stuff. - you will need a wire needle to get it through the holes. You can purchase these, or make your own. I used the Opelon to string it. To make a wire needle, take a piece of wire, light gauge, i.e. 24 gauge, about 4 - 6 inches long. Fold it in half, around a pencil or pen, and holding the two loose ends in one hand, rotate the pencil so that it starts to twist the wire. Hold those ends tight, and twist until the wire is twisted most all the way to the ends. Slip the pencil out, and you have a loop (the eye of the needle). Put your stringy stuff through the loop - which currently looks way too large to get through the bead hole. You may need to trim where the ends were if they didn't come together too neatly. Proceed to use it as a needle - the first bead you go through - you may have to tug it through - but the eye will squash to fit and, bonus, it will be flat enough to hang onto the stuff you are stringing with - so the needle doesn't keep unthreading itself. If that seems like too much work, you can just buy a pack of them! Start by stringing enough donuts as if you were making a single strand bracelet. I used a couple of different colours to make a blend, actually. I used 40. Then, tie a knot to secure. and continue the same way all around. Looking at the picture is probably clearer than anything I can write. Ok, once you have done that, you are going to go around again, doing the same thing, adding two and skipping three and going through the fourth. 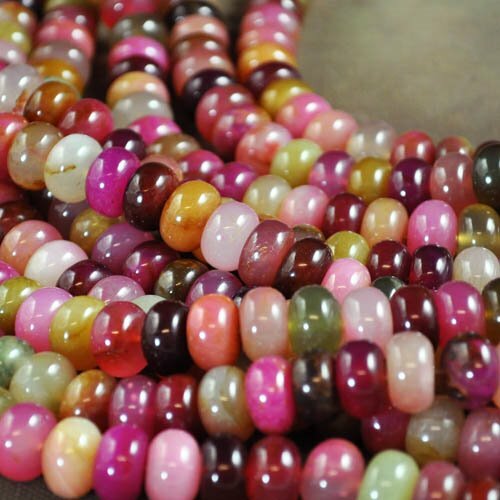 So ultimately, you will have one bead with 3 strands through it, that separates out into 1 strand with 3 beads, another strand with 2 beads, and a third strand with 2 beads. I did try it with stone donuts and the holes are too small for 3 strands through the one bead in the pattern that needs 3 strands through it. However, if you changed this bead to something with a larger hole, then it could work. And you would have a new look too! Overall - I used about 80 beads per bracelet. They are fun to make and easy to wear! OK, OK, I know I spoke about clay drying last week but. Dry clay is something I feel strongly about helping people prevent and deal with so...here I go again. I am going to give you a long list of tips that I find handy in handling your clay. Plan out your design before you open your clay. If you are like me and like to work out your design with you hands. 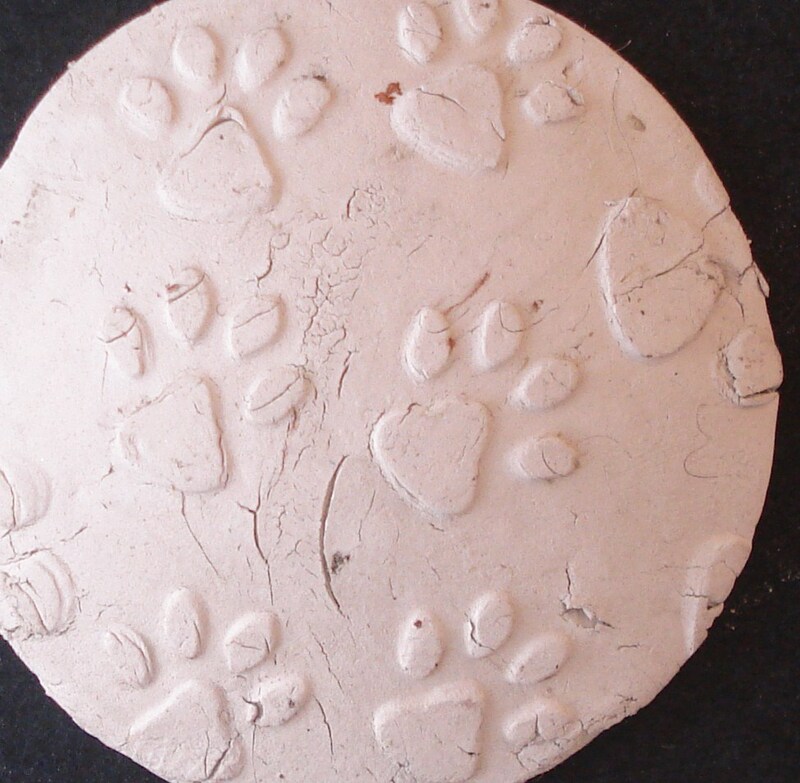 Try out a different type of clay to test out textures and designs. When I teach I have students use playdoh or polymer clay. I actually prefer the "playdoh" as it is easy to find, cheap and it will burn out safely if you accidently get it in your clay. Work quickly while your clay is exposed to the air. Any bits from rolling out clay should be gathered up and put in away immediatly. Have a damp paper towel and piece of plastic wrap on hand they can be used to cover your work if you need to stop briefly. Minimize overhandling of your clay. Everytime you handle your clay it dries a bit. (you can rehydrate as I showed in last weeks post but the less overworking the better). Hopefully these tips will help. Have fun!!! Arrr matey - there be treasure - gold pirate treasure, and silver too. I just noticed that the TV show Beads, Baubles, and Jewels is now (or almost - preorder) available on DVD. For those of you who have missed the episodes, or would like to keep a copy of them - You can preorder your dvd here through Interweave Press. We may be able to get them in as well if there is enough demand. First things first, I use the term patina here very, very loosely. A true patina (heat, and/or chemical) will hold up to wear and tear, and will continue to develop and age over time. This is just paint. I have protected it with a coating of renaissance wax, which will help it keep it's colour for a time, but do not expect this to last over the long term. - That said I'll tell you how it's done. First off, you'll need some metal you wish to paint. The metal needs to have some detail. The trick is to get the paint in the little crevices. The paint will not stick very well to a smooth surface. Some acrylic paint, and a somewhat firm bristled very small paintbrush. Squeeze out a few tiny blobs of various colours of paint. For example, I had a tray, and in each section I would use a blob or two of a colour, and a blob of white. Mix your colours, but don't necessarily mix them thoroughly. I found those pieces that showed multiple colours were quite interesting. Using your paintbrush, pick up a small amount of paint, and stab it into the metal. Continue stabbing a very small section. Get it into all of the crevices! Once you've painted about a centimeter or so in diameter, take your t-shirt or paper towel, and quickly, and firmly wipe off the paint. Repeat this process until your piece is completely painted front and back. You will find that the painted metal looks much better if it's not completely covered. You're going for the mottled patina look, not a straight colour. Let this set aside for a few minutes to dry completely, then using the old t-shirt again, apply a very small amount of Renaissance Wax to seal. This one was primarily burnt umber, white and crimson. It was a fun little project to try out, and I'm surprised at just how well the paint under the renaissance wax holds up! I finally had a chance to visit the store in person for the first time in two weeks (long story), I knew of course that the reno's were happing, and saw the pics on the blog. However, you really need to see the new space in person. First off, the store. Technically, it only gained about 300-400 square feet or so. However, the 300 square feet is no longer broken up by a half wall, which makes all the difference! The store looks huge! The electrician was hopefully in last night to fix the lighting at the back of the store. We had a metal clay playday yesterday, and the extra room to spread out was quite nice! The studio is still a bit of a mess, and everything is still going back and forth between the admin offices, and the rest of the store. The studio will probably be a few weeks, but there are plans to reorganize everything in that room as well. June is just around the corner and we have some great classes booked for the month. If this weekend is any indication of the weather we are in for this summer it looks like a hot one, what better to cool down for a bit but to swing by for a class or two! Nadine Foskin is a fabulous designer. Her unique approach to jewelry making has been influenced by her background in Fine Arts and her love of fashion. She received a BA in Fine Arts with an Honours in Studio from Bishops University in QC, followed by a Diploma in Design from George Brown College in Toronto. After working as a Graphic Designer she found herself in the Bead World applying color and composition techniques to a whole new palette. With a youthful outlook and a keen sense of style - Nadine has her finger on the pulse of today's trends. She has taught various classes at BeadFX and for the Toronto Bead Society. Nadine has 4 different classes coming up in the next month or so. All of them are beautifully designed and perfect for the season. Thursday May 27th Double Strand Dangle Bracelet. Students should have a some experience with wrapped loops, it is an advanced beginner to intermediate level class. Thursday July 8th is the Dangle Drop Earring. Open to all levels. Saturday July 17th is the Dancing Dahlia Pendant. Open to all levels. What's new you may ask? We have started the summer and fall schedules and new classes will be going up every week for the next little bit. We encourage you to check regularly for updates. Rae Huggins has also got a number of new classes coming up. Saturday June 19th is the Right Angle Weave Lariat. This class will prepare you for Marica DeCoster's upcoming classes if you are unfamiliar with the right angle weave stitch. Sunday July 11th Make it and Take it Earrings and Pendants. Open to all levels. Don't forget to check the calender for new additions! When you go to big shows and conventions, like Tucson or Bead and Button, you are going to the one event where you can wear your most fabulous jewellery and have it be really appreciated. There is no such thing as wearing too much jewelry at these events! But - when you wear it to an event like the upcoming Bead and Button show - well - you WILL be stopped in the street by admirers. Not just people who think it's an attractive personal adornment - but by folks who appreciate that amount of time and effort, the care spent selecting just the right beads and the skill in the execution of your fabulous piece. They may well be wearing something equally fabulous that you also can admire, and yes, even envy. So, if you've never been to a show - you should try it at least one time for the experience of feeling like a minor celebrity. It's a pretty cool sensation. Of course, you can always come into beadFX if you need an appreciation fix - we're never too shy to stop in the middle of a conversation and admire your jewellery. And what is the well-dressed bead buyer wearing this season? Why - this fabulous little number made by her fave designer - the inestimable DragonJools - Dwyn Tomlinson. This stunning creation features one of Dwyn's fabulous new-this-season focal lampwork beads called "The Sundered Heart." Representing both the strength and the fragility of love, the Sundered Heart appears to be torn apart but still "hanging in there, baby!" Matching handmade beads are accented perfectly with Swarovski Crystal Elements in Crystal Moonlight and Indian Sapphire. A gorgeous Sterling Silver cat-themed clasp is a nod to Marg's love of cats. Overall, the piece is 18 inches and contains 18 6mm Indian Sapphire Swarovski Bicones and the same number of 6 mm bicones in Crystal Moonlight - the extra sparkle of the Crystal Moonlight being a perfect complete to the water-clear lampwork beads. The handmade glass beads feature Creation is Messy's deep transparent inky blue called Leaky Pen and Lauscha Clear - famous for it's perfect clarity. Ciao dahlink! See you on the runway! One of the biggest problems that plagues newcomers to metal clay is drying clay. Silver metal clay and some of the other metal clays can dry extremely quickly resulting in cracks in your designs. Sometimes the cracks can be a welcomed organic look at other times it can be quite frustrating. Good news though with preparations and tricks these problems can be overcome. Here are some examples of what I mean and a solution. 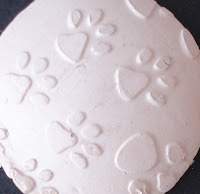 First, here is an idea of how the clay dries. I rolled two pieces of fresh low fire silver clay then wrapped them over a small dowel. The piece on the LEFT was shaped 1 minute after rolling fresh regular low fire clay. The piece on the RIGHT was rolled at the same time but left to sit on my work surface for 3 minutes before I shaped it. You can see there are cracks forming on the bail shape on the left. This demonstrates the speed at which metal clay can dry. Air humidity can affect this as well as the freshness of your clay so your results may be different. 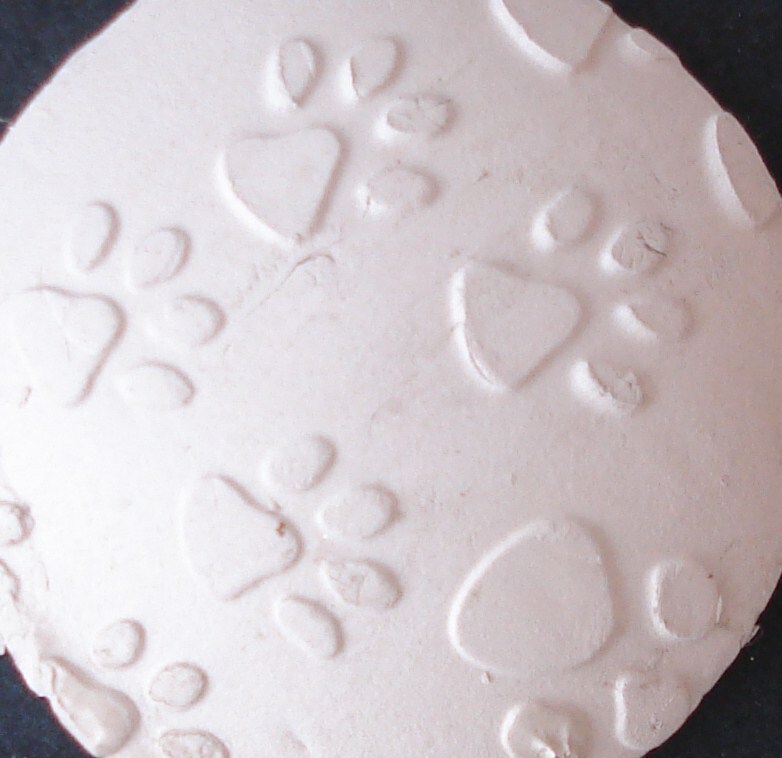 Above are examples of over worked clay. The cracks and flaws are evident and would require quite a bit of work to fix. 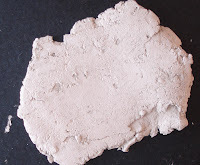 If your clay is cracking but has not really hardened you can rehyrdrate it with this trick. There are several tricks but here is the one I find the easiest. 2. Fold the edges in over the water and roll again. Repeat this several time until the clay begins to feel smoother/wetter. Ideally if you can allow the clay to rest for an hour or overnight the clay will be much better to work with but this can work in a pinch. 3. A good test to see if the clay is in a good texture is to roll into a tight ball, if the ball has not cracks then it is good to go. Being prepared and working quickly to avoid dry clay is ideal but doesn't always happen! There is a learning curve in mastering metal clay. Having this trick in your bag should help you on your way of being a master of metal clay. A large heaping scoop of schadenfreude - that's what this site is about. (Schadenfreude - pleasure in someone else's misfortune - in case you missed the meaning of this oh-so-useful word). This site - the Smoking Gun - features mug shots of celebrities - actual mug shots - taken when they were arrested for their excesses of behaviour and/or lack of judgement. How ghastly do they look with out their make-up, careful lighting and sympathetic photographer? Is the mug shot the ultimate leveler? You decide. You can gloat over Bill Gates being arrested for a traffic violation in '77 (although, admittedly - he looks about the same) - or how about someone from the historical section, such as "Tokyo Rose." Seed beaders rejoice! More itty beady beads - new Delica 11/0s and Toho 8/0s and 11/0s. Lot's of stuff for seedbeaders in the magazines lately too. There's a lot to be said for investing some time and about 50 cents worth of beads to get something fabulous! As opposed to my usual approach which involves less time but much more expensive materials! Flowers on the brain, and peony envy. I'll admit, I had a hard time coming up with something to yammer on about today. I have just a few late items on my to do list (Yes, Helen - I swear they're going up today!). Once those are done though, it's out to the garden I go. The veggie plot is all dug up, I just need to pick up a few bags of top soil, and I'm good to go. The front will be getting the addition of a few annuals, and I've got my pots to do as well. I have a love affair with Dahlias, but I can't remember if I'm too late to plant those or not. I'll have to look that up. I'm really, really hoping (especially after seeing Dwyn's) that my peonies will bloom this weekend. They've got lots of nice big fat buds, crawling with ants...What is it with peonies and ants anyway? If you need a little gardening inspiration - one of my favourite sites is You Grow Girl - she's a Torontonian to boot! Enjoy your long weekend - whether you're beading, gardening, or whatever else strikes your fancy - just do it outdoors! The carpentry was finished yesterday and Rosemary and the rest of the staff are already busy moving stock into our new store section. We'll have a whole wall of Japanese seedbeads, both Miyuki and Toho, with space left for the new colours as they arrive. The wall at the back of the room already has the wire and wire-working tools neatly displayed. Base metal findings are along the wall to the classroom and silversmithing and other tools will be along the back wall. It's still a bit dark back there, but the electrician will be here right after the 2-4 weekend to upgrade the lighting throughout the store and the classroom. just in case you somehow missed the update last night. I need these. All of them I think ;-) get em' before I do! It's called Bookmooch, and the premise is you post books you want to give away, and create a wishlist of books you'd like to receive. It's completely free, and the only cost to the user is your postage when sending books out. It's an international site, and some of you may know - many books that are published in the UK, other parts of Europe, and the rest of the world, never make it over here. I've compiled a nice big list of UK editions of books that I can't wait to get my hands on. Lots of books available in foreign languages too! It works on the point system, which is quite beneficial to those of us in Canada. For example, to mooch a book you need one point, but if you send a book out anywhere other than in Canada, you get 3 points. So that's three books for the price of shipping one. Which works out cheaper than used book stores! I couldn't find any beading books though.... :-( Most likely due to the fact that most of us don't want to part with our beading and jewelry books. I know I don't! 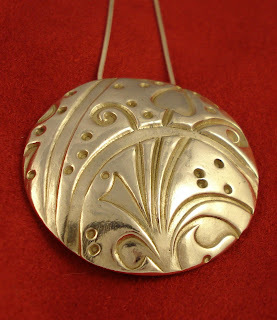 Fine silver, or metal clay that is? I'm sure many of you have wondered what to call it when you are selling. 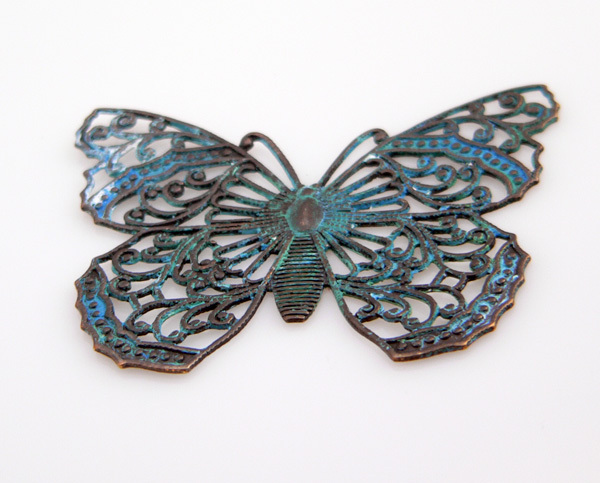 I just ran across an interesting article by Suzanne Wade on the Orchid list site - Ganoksin - Which is THE jewelry making mailing list. Catering to goldsmiths, it is the largest, and in all probability the best source of jewelry making info on the internet! New Classes with Robert Burton! Before I get to the new stuff with Robert Burton, just a quick note about Beau Anderson. Due to some travel conflicts he has had to post pone his classes here this May. We are currently working on re booking them for the fall. Stay tuned for details. Robert Burton has a number of new classes coming over the next couple of months. These will be appealing to those of you who are interested in taking his classes, but cannot get here on an evening during the week, are out of town, or are unable to commit to a 3 week class. Saturday June 12th is the Beaded Bow Bracelet from 9:30 to 12:30pm. In this class you will begin to learn the basics of wire working. Kits, for all of Roberts classes, are available in three colours: copper wire, Argentium silver or gold filled. This class is open to all levels. 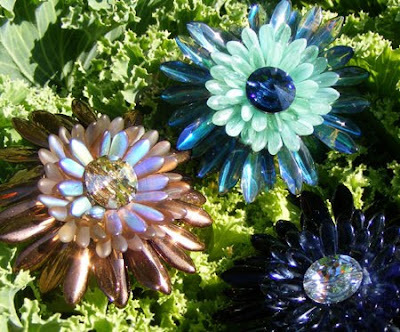 June 13th, from 1 to 4pm, is Crown and Cabochon Pendants. This class is perfect for those of you wanting to learn to make your own pendants with wire and cabochons. This is also open to all levels. Coming up in July are the 3 Bead Pendant class and Rings and Bling class. 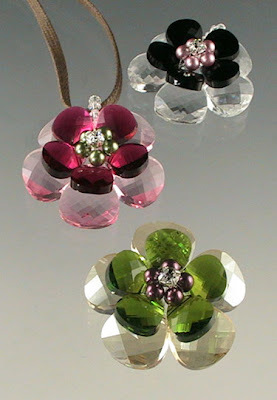 The 3 Bead Pendant class is on Sunday July 18th from 1 to 4pm. Saturday July 31st is Rings and Bling from 9:30 to 12:30pm. Both of these classes are open to all levels. Time for the annual blooming of the Tree Peony report. I blogged this when I first bought it, in 2007, and again, last year, when it bloomed, which was May 25, so if you are feeling like stuff is advanced in your garden, you'd be right - as this year, it unfurled it's opulent bud of paper-thin petals on May 15 - a full 10 days earlier than last year. And, you can see that Soggy, the Loch Scarborough Sea Monster, has already put in an appearance in the pool. The good news is, it cuts down on the amount of dog hair in the house. The bad news is that I won't be able to find a dry towel until September. Vacuuming or laundry - which level of hell do you prefer? Barely visible in the background behind said sea monster in the line that holds the pool thermometer, suspended from the filter cover - which means tied through a hole in the cover and dangling over the concrete block, and suspended about 3 feet down in the pool. The thermometer stays there, all summer, in full blazing sunlight. What I have been using for the past 2 years to hang the thermometer is our Satin Rattail cord. It's handsome, functional, and most important, I had some and could find it easily. And what a stress test, eh? If it can survive those conditions . . . it will survive anything. And survive it does. Last year, I used a dark blue piece, and the year before, I used black. It even keeps it's colour, not fading until my significant other does the annual over-chlorination of the pool - whereby it spends about 3 days with the chlorine level too high, and at that point, the color, where the cord is in the water, will disappear. But despite the constant soaking and intense heat and uv, and wearing on the side of the pool, the cord has lasted admirably well. For the record, I'm using White, and medium strength. I have the strand quadrupled, but that's because I cut way too much. I knotted it to the filter cover (not crimped). We shall see. Hi, it’s Heather (Bell Denison) a.k.a. Fine Silver Girl here. I will be guest bloggin’ on Sundays. 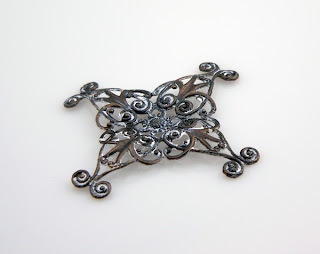 I am one of the metal clay Instructors at BeadFX. I fell in love with metal clay several years ago when I took my first metal clay class at BeadFX with Jennifer Tough. Since then have spent many hours playing with all types of metal clays and I have become a Senior Certifying Art Clay Instructor. This all means that I have a lot of metal clay experience and tons of information to teach and share. Guess what? I will be sharing that information on this Sunday edition of the Beadful Life. I have a long list of topics to share but feel free to suggest some and I will try to oblige. Metal clay is made up of fine particles of metal mixed with a binder and water to form a mailable substance. 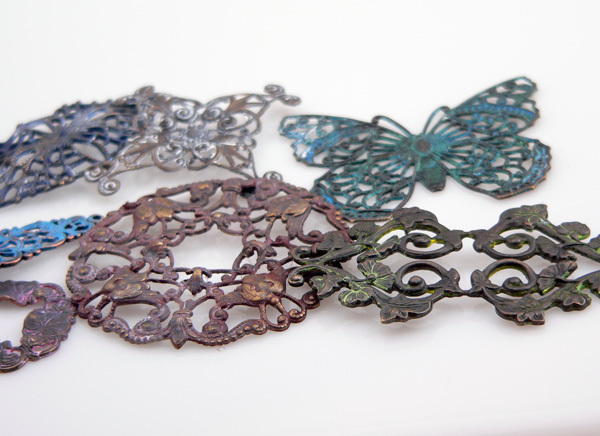 You can roll, texture, build and sculpt with metal clay. Once you have your clay in the shape you want it you dry it and fire it at high temperatures. The firing process causes the binder to burn off and the metal to sinter resulting in solid metal. Sintering is a process that heats the powdered metal to some point below the melting point and causes the metal particles to bond and become solid. Yes the result is Solid METAL. What is it the makes metal clay loved by many? 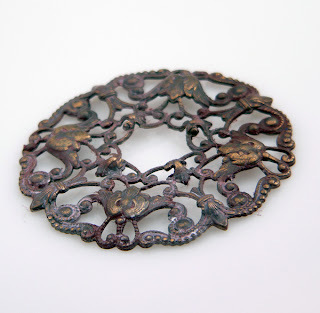 Metal clay can be textured easily! Once you know the basic principles of working with metal clay the options for creation are endless. This was a simple introduction to metal clay. I will be posting information for all levels of metal clay enthusiasts from the beginner “I’m afraid to open my pack of clay” to the more advanced “What next ”. Here's another ecommerce enabler for those of you who would like to set up a site and sell a few pieces, without getting lost in the overall marketplace that is ebay and even etsy these days. It's main focus is artists, but unlike sites like etsy - it is not a portal to a multitude of sellers, so you have less risk of your customers wandering away from your site and off to shop elsewhere. Big Cartel is a hosted website - so no need for a server or such. They have a free account, which allows you to sell 5 different items - not bad for testing the waters. Their premium account is $20 flat fee per month, and you can have up to 100 items for sale. Think about it - do you actually have more than 100 different handmade items? OK, maybe you do, but lots of us don't! You can use Canadian currency, which keeps your Canadian customers happy, and it uses Paypal to accept payments. Easy peasy, and the people I have talked to who are using it are very happy with it. Sorry folks, for the lateness of this - every time I have sat down today to write this, I have been foiled by life. 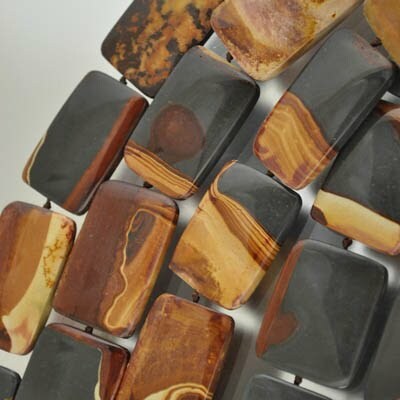 Anyhoo, coming at ya, next week, some stone beads. 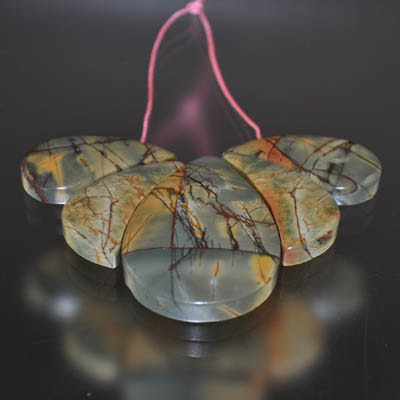 These rather fabulous 5 piece sets, in Red Creek Jasper, and Wonderstone. I'm not being facetious. Google it. Wonder stone or Wonder Rock. Rather wonderful, actually. Beau Anderson--Registration Deadline this Friday!